I find it interesting that Greninja’s an exceedingly popular character for a Pokemon that has only come out in the last 5 years of Pokemon history. Starters are popular by default, for sure, they’re some of the first Pokemon you see in the game with each generation, but Greninja’s popularity feels like it rivals Charizard’s at this point. I just think that’s interesting to note. Greninja-GX is a Stage 2 Water Pokemon-GX, 230 HP, with a Grass Weakness, no Resistance, and a Retreat Cost of 2. He’s got an Ability in Shuriken Flurry, where he deals out 3 damage counters to any opposing Pokemon when he comes into play. Haze Slash is then a 3-for-110 move that lets you shuffle back Greninja-GX and all cards attached to it back into the deck, with Shadowy Hunter GX costing the same and dealing 130 damage to any 1 Benched Pokemon your opponent controls. Historically, Abilities like Shuriken Flurry are pretty strong. The ability to manipulate and lower the number that it takes to get a KO and claim a Prize card is always good, and with his main attack, Greninja-GX can not only avoid the KO himself but reuse this Ability again. This makes Greninja-GX a very real potential threat in the upcoming metagame, since it’s very hard to OHKO something with 230 HP (outside of Dusk Mane Necrozma-GX and the like), so he’ll prove difficult to approach. On the flip side of that, he has to be run alongside a partner, as bouncing him back constantly would just limit your Bench and ultimately what Pokemon you have in play, and you can’t bounce him back if you don’t have any Bench-sitters…well, I suppose you can, but you’ll lose automatically, so you shouldn’t. Outside of a tactical usage of his Mist Slash and Shuriken Flurry, Shadowy Hunter GX isn’t one of the strongest GX moves out there damage-wise, but it can be very effective. Most powerful Bench-sitters tend not to have more than 130 HP most of the time, so having the power to not only get rid of one of these is effective – it can definitely turn the tide of battle in your favor. So keep an eye out for the new Greninja deck, since the other one is rotating out later this year. Arora Notealus: At this point, I do wonder if they’ll reintroduce Mega Pokemon into the game. M-GX don’t seem like that big a stretch in the grand scheme of things, they’d almost act like a bonus towards GX already existing, like a mix of M-EX and BREAK. But who knows, they don’t seem too interested in revisiting the Mega Evolutions idea any time soon. Side Review: Order Pad – Certainly a worthwhile addition in the deck, Order Pad could actually help with searching out Water Patches to boost Greninja-GX. Alternatively, it can grab Rare Candies to evolve Froakies straight into Greninja-GX, so it’s got some versatility in the deck. Worth at least considering, even with the coin toss. Next Time: And here you thought it couldn’t get better, AND THEN WE GET A TWOFER!! Should I feel excited about a popular Pokémon making another appearance in the TCG? Well, today we’re looking at Greninja-GX from SM Forbidden Light. As a Stage 2 Pokemon, it could be harder to play unless you have a shortcut like Rare Candy that can make the Basic evolve into a Stage 2. However, Greninja-GX entire evolutionary line should try to convince you not to use Rare Candy because Frogadier has a similar ability. 230 HP makes it a bit low on the Stage 2 GX spectrum, but is still hard to take down in one shot outside of resource commitment and a few beatsticks. Being worth 2 Prizes offsets the high HP to some extent. The grass weakness is a concern, though; if Golisopod-GX is still prevalent, then it’ll take a single First Impression to OHKO this Pokémon. The retreat cost of two is annoying because it isn’t legal for Heavy Ball to search for and you don’t want to needlessly discard energies just to retreat. Quite unfitting for a Ninja Pokemon. Greninja-GX has an ability and two attacks. The ability, Shuriken Flurry, works when this card evolved from a Frogadier. When it does, you may place three damage counters on one of your opponent’s Pokemon. This ability is a one-and-done deal, so if you want to use such abilities repeatedly, you’ll need something to devolve or bounce Greninja-GX to your hand and evolve a different Frogadier. Devolution Spray and Super Scoop Up are good examples. I will also mention it’s pre-evolution, Frogadier. It’s ability, Quick Shuriken places two damage counters on one of your opponent’s Pokemon. Both abilities strongly resembles both Golbat and Crobat (XY Phantom Forces 32/119 and 33/119) since its Sneaky Bite and Surprise Bite Ability did the same thing. It’s HP might be low at 130, but it’s worth a single prize. It is only Expanded legal, however. Golbat and Crobat was reviewed by the Pojo review crew on January 15, 2015 and January 16, 2015. Bench Barrier from Mr. Mime cannot block damage counter placement, but Machoke’s Daunting Pose does block them. So the ability alone is good, but what happens when Greninja-GX is stranded up front? Then it has to try being an competent attacker. Both costs WCC, making Double Colorless Energies worth investing on. Haze Slash does 110 damage and you may put this Pokémon and all cards attached to it onto your deck. This……is actually worse than putting it into your hand. Although you could undo the damage that Greninja GX took, having to search for cards once more just after you used up resources makes the flow of drawing cards rough. You can’t have too many Sycamores, N, or Cynthia. Finally, it’s GX attack, Shadowy Hunter, does 130 damage to one of your opponent’s Benched Pokemon. I find that attack to be mediocre at best. Though backed with multiple uses of Wind/Quick Shuriken, that amount might be enough to pick off some Benched Pokemon for easy prizes. Like Garbodor, for instance, whose wields ability lock, and Shadow Assassin alone takes it out. Hazy Slash will still OHKO Garbodor if it’s bought into the Active spot. Shaymin-EX/Jirachi EX also gets chiefly OHKOed by both attacks. Tapu-Lele GX may get OHKOed, but needs a couple snipe abilities to achieve this. In terms of deck construction, Greninja GX is actually a separate card, so you can have up to 4 Greninja and 4 Greninja GX in your deck. However, since they share the same stage, and you can have up to four of theses stage 1s, you couldn’t have more than 4 Stage 2s of the same evolutionary line in play. However, Greninja does have another card that could help your setup of getting more than four Greninja into play. And that’s Frogadier (XY BreakPoint 39/122). It’s attack, Water Duplicates, fetches three Frogadiers from your deck into your Bench, skipping Froakie completely! That means you could have a full team consisting of Greninja Break and Greninja-GX, well, up to six of any combination due to Bench space. I have not seen anyone tried using its Break Evolution and the GX in one deck. Both fulfill different roles and would prefer to not use them together. Greninja GX would be used in a similar manner to Crobat, though it would have to compete with Decidueye GX. The difference is that Feather Arrow works every turn while Quick Shuriken and Shuriken Flurry works only once. With two turns due to manually evolving into Greninja-GX, you’ll place a total of five damage counters; Decidueye-GX will continue to place 2 damage counters even after the third turn, making it more resourceful than Greninja-GX. Their HP scores are not safe from OHKOes, so if Decidueye GX goes down in one shot due to Fire weakness or raw damage when you barely pull off one Feather Arrow, then Greninja-GX will be better if you know that it won’t last long in the field. You still made a mark bigger than arrows. Greninja-GX could be its own deck by combining their abilities and attacks, or could be used with other partners who would benefit damage counter placements because their attacks fall short of hitting important numbers. You shouldn’t have to attack with Greninja-GX too often, since an attack cost of WCC isn’t easy to meet. This isn’t like Crobat having a free attack via Dimension Valley, you have to devote resources to fuel up WCC, which would be one Aqua Patch and DCE attachment. Otherwise, you’ll have to wait for one turn, and it could be one turn too late. Overall, Greninja-GX carries on what Crobat left off for Standard, so players may be overjoyed to have a reintroduced ability back, and it’s tacked on a popular Pokémon! So it might see a lot of play for the time being and then eventually fall into obscurity when such strategy doesn’t work out in the long run. As for Expanded, however, Crobat is still in that format, and they would prefer to use Crobat over Greninja-GX, mostly due to being worth one prize as it is a non-GX Pokemon. Still, options are nice to have. As for Limited, running a 1-1-1 should be formidable on its own, placing a total of five damage counters before unleashing their own attacks. Backed with both Shurikens and Haze Slash, you’ll do 160 damage, but if you focus on the bench, both Shurikens and Shadow Assassin will do 180 damage total, enough to KO some GXs. Greninja GX (FLI 24) hops back into the meta out of the Forbidden Light expansion set. We all know the Frogs – some of us love ’em, most of you hate ’em, but the Shadow Stitching / Break archetype has really defined my time in the game. It was released in February 2016, right around the time I started playing, so I’m a little sad to see that version of Greninja leaving us in just a couple of short months. This new Greninja GX is nothing like the Break archetype. This is actually more akin to the Bats from Phantom Forces. When you evolve Frogadier or Greninja GX FROM YOUR HAND, you get to place two or three damage counters (respectively) on any of your opponent’s Pokemon. Gone also is the devastating Shadow Stitching attack, but Haze Slash isn’t awful. It only does 110 damage, but gives you the option of scooping your Greninja GX and putting him back into your deck. While 230 HP is the lowest amount of HP a Stage 2 can have and still leaves Greninja GX vulnerable to First Impression, Sunsteel Strike, and Photon Geyser, most of the time you won’t get OHKO’d, giving you a great opportunity to use Haze Slash to effectively wipe out all of the damage from your opponent’s last attack. 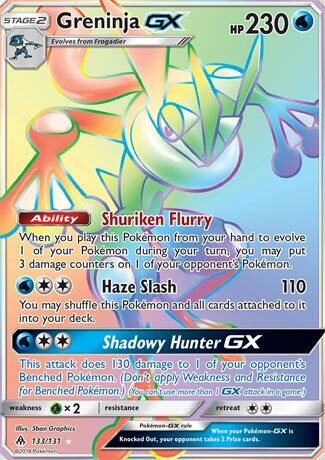 Shadowy Hunter GX is also a good GX attack – you can finish off damaged Pokemon your opponent is trying to hide on the bench or maybe disrupt your opponent’s strategy by eliminating one of his key tech supporting Pokemon on the bench. Even better for Greninja: Golisopod GX and Tapu Bulu GX are becoming less common, and the Leafeon GX archetype has yet to yield a competitive decklist, so it’s seeing very little play. Unfortunately, I am only 7 W 8 L with this deck as I again struggle to get Milotic’s TLC attack to work. In Theorymon, this is great: drop some damage counters on your opponent’s benched Pokemon, throw them back in with TLC, and then finish off whatever Pokemon are remaining with Greninja GX. Unfortunately, it just doesn’t consistently work. I’ll keep hammering away at it – I’m sure there’s an effective decklist in here, maybe not Tier 1 but a good disrupting, frustrating decklist that will win more matches than it loses, I’ve just got to find that list. Until then, the Glaceon GX or Zoroark GX builds are probably the best. I did see one video on Golisopod GX paired with Greninja GX and it did not go well, and I’ve heard of Greninja being paired with Buzzwole… to which my question is why? Do you really think Buzz needs to do more damage? Or, with all the modifiers Fighting has now, are you just going to eschew Knuckle Impact and Absorption GX and just use Jet Impact every time? Note: My original review suffered an embarrassing copy/paste error, causing a large chunk of it to be repeated in the middle. This has now been corrected, but that didn’t happen until March 6, 2019. Additionally, some revisions and reformatting were also implemented. My apologies for such a sloppy mistake! Our fourth-place finisher is Greninja-GX (SM – Forbidden Legends 24/131, 120/131, 133/131). Greninja-GX to earned 96 voting points, three more than yesterday’s fifth-place finisher and four less than tomorrow’s third-place pick. Greninja-GX accomplished all of this by not only appearing on all five of the reviewer’s personal lists, but managing a Top 15, a Top 10, a Top 5, a Top 4, and a Top 3 finish. I’m the one who lowballed it, for the record, placing Greninja-GX in 15th place on my own list… and you’re about to find out why. Greninja-GX is another card that recycles tricks from the past. Crobat (XY – Phantom Forces 33/119) has an Ability that triggers when you play Crobat from your hand to Evolve one of your Pokémon during your turn. “Suprise Bite” then allows you to place three damage counters on one of your opponent’s Pokémon; you pick which Pokémon can elect to not damage any of your opponent’s Pokémon at all. Other than being named “Shuriken Flurry” to better fit the flavor of Greninja-GX, its Ability is the same as that of Crobat. Perhaps the next most important thing about Crobat AND Greninja-GX is not actually something about themselves, but their Stage 1 forms. Golbat (XY – Phantom Forces 32/119; Generations 31/83) has the Ability “Sneaky Bite”, which functions the same as Suprise Bite except it only places two damage counters instead of three. Frogadier (SM – Forbidden Light 23/131) makes this trick its own by renaming it “Gale Shuriken”. This isn’t to say that Zubat never mattered, just that it was less significant than its higher Stages of Evolution. These Abilities allowed Golbat and Crobat to become a major backer of certain decks, helping another attacker either offset lower damage output paired with a useful effect (Item lock, damage spread, etc.) or otherwise attractive attacks that fell a bit short of what was needed for OHKO’s/2HKO’s. Golbat and Crobat were not always competitive, however, and are not currently significant to the competitive Expanded Format, at least according to a quick search of recent tournament results. This bodes well for Greninja-GX, as the metagame doesn’t seem so dramatically different now as compared to when Crobat was riding high. We don’t have AZ or Scoop Up Cyclone, but we have Acerola and we still have Super Scoop Up; no Landorus-EX, but we have Buzzwole-GX. Which doesn’t mean the rest of Greninja-GX doesn’t matter. The big thing is that Greninja-GX may need to be the focus of the deck, not the back-up. Yes, decks using the Crobat-line often had quite a few cards included to support that line, but most also worked out for the deck’s primary attackers. Crobat and Golbat both had free Retreat Costs, and the preferred Zubat was BW – Plasma Storm 53/135, which had an Ability that zeroed out its Retreat Cost while it had no Energy attached. In other words, they could easily get out of the way. While on the low-end for a Stage 2 even back then, Crobat’s 130 HP was still a little more likely to survive a hit than not. Golbat and Crobat had underpowered but sometimes useful attacks that only required [C] to use. As such, not only did they fill the “pivot Pokémon” function, but sometimes they could finish off or help set up KO’s while soaking a hit. This allowed bouncing them with a card like AZ to flush away damage counters while enabling you to reuse Abilities. Greninja-GX has a much more impressive HP of 230, but it is also worth two Prizes; that is going to be as much and possibly more than your preferred attacker(s). All Weaknesses are risky, and the [L] Weakness possessed by Crobat varied in its severity. [G] Weakness could easily spike or find itself dropping after the current set, but strikes me as more of an issue because – again – Greninja-GX is worth two Prizes and has more HP: it has a greater chance of proving significant, instead of merely resulting in overkill. The [F] Resistance on Crobat actually was to its benefit at times, but Greninja-GX has none even though its HP would likely have made it more significant (unless it was to a fringe Type). Its Retreat Cost of [CC] isn’t the worst, but it is still enough to get it stranded in the Active spot. Its regular attack, “Haze Slash”, requires [WCC] to do 110 and also allows Greninja-GX to shuffle itself back into your deck along with all cards attached to itself. This isn’t a budget attack, but it isn’t as expensive as it might look thanks to cards like Aqua Patch and Double Colorless Energy. It isn’t a super-splashable [C] cost attack like Crobat and Golbat had, which they sometimes could use for free if Dimension Valley was in play. Haze Slash should allow Greninja-GX to be, if not a deck’s main attacker, a solid secondary. “Shadow Hunter-GX” is Greninja-GX’s GX-attack, costing the same as Haze Slash but doing 130 damage to one of your opponent’s Benched Pokémon. Being able to hit the Bench can save you using a Supporter or Ability to force a target into the Active position, and while you can’t boost damage to the Bench you can fake it with the Abilities on Greninja-GX and Frogadier. Really annoyed you cannot use Shadow Hunter-GX on your opponent’s Active. As this is a once-per-game option, having the option to hit your opponent’s Active for 20 more damage than what Haze Slash can do instead of hitting something on the Bench doesn’t seem like it’d cause problems. What happens when we put it all together? I think we have a Stage 2 Pokémon-GX trying to do the job of a baseline Stage 2. The good news? I think it does the job well enough that we’ll at least get one competitive deck out of it. The bad news? I’m not expecting much more than that, at least coexisting at the same time in Standard or Expanded. Being a Stage 2 can be a bitter pill in the Limited Format as well; if you can pull the entire line, it is worth running in ANY deck that isn’t a +39 build. Yes, even if you can’t make room for [W] Energy! If you can include at least a few, you can cash in on both Abilities then recycle the entire line (and Energy!) while using Haze Slash. Shadow Hunter-GX is a lot more useful when no one can run a Guzma. In the end, though, you have to deal with actually drawing into the entire line (or the few search cards you’ll have available) and you may be entirely out of luck if the wrong thing is Prized. Next articleYGO News: “Shadows over Valhalla” renamed to “Shadows in Valhalla”.